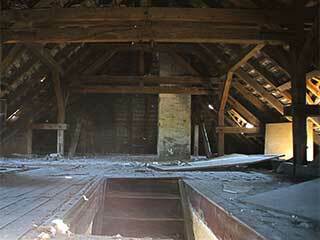 Due to the location of the attic at the top of the house, it is naturally the most forgotten area at most residences. Sometimes, it also means that we forget to clean it and keep things organized up there. This problem gets serious when we neglect it for long periods of time. Then the dust turns into harmful bacteria just waiting for its chance to hurt the house's residents. Bacteria soon becomes friends with mold and the condition gets worse by the day. But neglecting that area is not the worst mistake people do when it comes to its proper cleaning – here are the 3 top ones. The attic holds a lot of hidden corners and it sometimes has very narrow areas, due to its physical constraints and layout. When people attempt to clean the attic by themselves, they do it with great risk for their health, especially as they try to get to those hard-to-reach corners, that are sometimes very high or behind closets. When you add to that that the way they clean is not always too effective, you can clearly understand that it simply isn't worth the risk. As mentioned above, an unclean attic might get to the state where it's contaminated with mold and bacteria. Meaning that simple dusting is not about to cut it this time. So, you put yourself at risk and for what? The attic's severe condition would remain the same anyhow, so wouldn’t it be a shame to hurt yourself for no good reason, or simply to waste time and energy? Guess the first incorrect assumption about this matter is that it doesn't require the care of a professional – which it absolutely does! The mistakes mentioned so far, in addition to other mistakes about attic cleaning, are all derived from one big misconception – thinking that this sort of cleaning task does not require the services of a professional. But is does. It does because it is involved with cleaning materials that require professional knowledge as well as experience. Professionals also have the equipment to allow them to get to those hard to reach corners quite more easily. That's how you ensure thorough cleaning with no risk to your wellbeing. Don't make the same mistakes so many people do! If you need attic cleaning services, call us now and we will happily be of assistance.